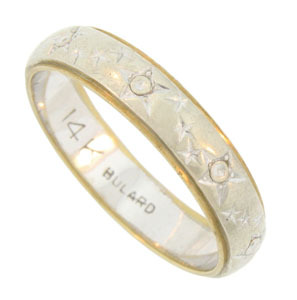 Celestial engravings cover the face of this 14K bi-color estate wedding band. 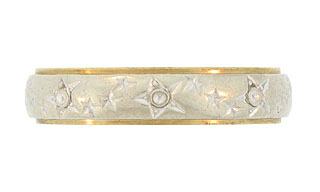 The elegantly engraved stars encircle the surface of the white gold central band. Slim yellow gold bands frame the white gold design. The handsome wedding ring measures 5.0 mm in width. Circa: 1950. Size 11 1/4. We cannot re-size.